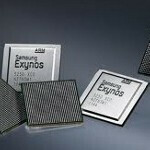 Back in January, we told you all about the Samsung Exynos 5250 chipset which is expected to begin mass production next quarter. Back in the beginning of the year, Samsung spilled the beans on the 2GHz, ARM Cortex-A15 set up which the Korean based company said could double the performance of A9 chips and even outperform current quad-core chips. It will have 2 CPU cores and 4 GPU cores. Thanks to a leaked slide obtained by Semi-Accurate, the GPU is confirmed as being the Mali T-604 as we figured out back in January. 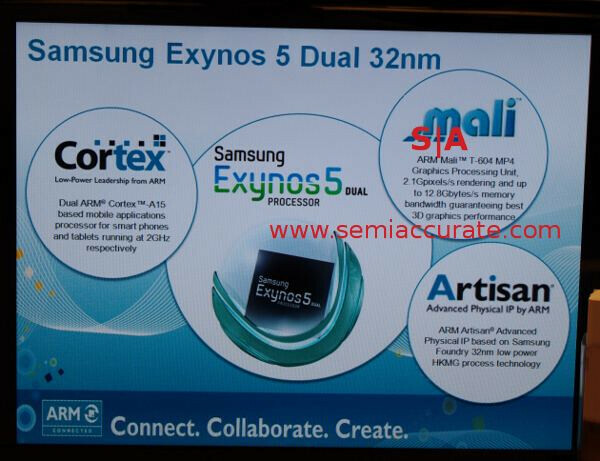 The latter's 2.1 gigapixels per second rendering and a wide 12.8GBps memory bandwidth offers about four times the performance and better 3D graphics than that of the Mali 400, which was part of the Exynos 4210 used on some models of the Samsung Galaxy S II. The slide also displays the 32nm manufacturing process of the 5250 and shows off the chip as part of a larger Exynos 5 dual line which could hint at faster clock speeds or single or quad-core variants of the chip. Back in January, Samsung said that the 5250 would first be used in tablets before being used in smartphones. Samsung should put the duel core A15 in the SG lll (even if they have to delay the launch, it would be worth the wait) & use a quad core A15 for their next tablet. I really don't want to use my upgrade on a A9, no matter how many cores it has. Will you really be able to make use of the difference between a Quad core 32nm A9 processor vs a dual core A15 processor? Or are you just being a tech elitist..? Lmao Actually, im just stating my preference. Im not willing to use my upgrade for old tech. I already have a A9 & want the best tech available. I don't think 14nm will be available until 2014.